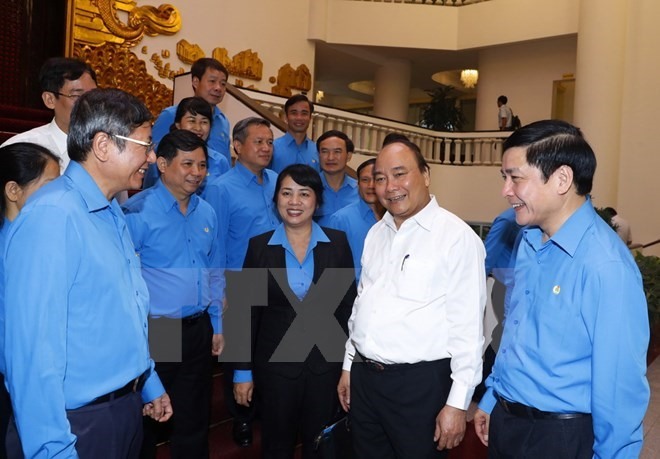 HÀ NỘI – The government will offer all possible support to businesses, start-ups and create jobs for workers, Prime Minister Nguyễn Xuân Phúc has said. He made the statement during a working session in Hà Nội yesterday with the Presidium of the Vietnam General Confederation of Labour (VGCL) to discuss work between the government and VGCL and set tasks for 2017-2018. The PM hailed VGCL chapters for improving workers’ lives and dealing with workers’ complaints. The VGCL was asked to join the government’s mechanism building, with a focus on ensuring rights and interests of workers in the process of building a transparent, constructive and action-oriented government in service of the people and businesses. The VGCL should step up campaigns to strengthen the working class’s trust in Party and State leadership while improving social supervision and the enforcement of labour laws, he said. At the same time, it should work with agencies to offer vocational training to labourers amid the fourth industrial revolution. He urged the VGCL to hold more dialogues and meetings between the PM, ministers, heads of sectors and workers. The leader suggested the VGCL partner with the Ministry of Labour, Invalids and Social Affairs and the National Wage Council to devise a plan on regional minimum wages to submit to the PM. He also responded to proposals by the VGCL, including amending the Labour Code’s terms regarding overtime, retirement age, meals for workers and providing preferential loans for workers in industrial and processing zones.